A functional solution to interfacitis? The main reason I decided to start this blog is that I have begun working for a company that has genuinely challenged many of my assumptions about how software should be developed. I have spent much of my career learning from the more prominent voices in software development about how to write software effectively. I have learned, practiced and preached the tenets of clean code, TDD, layered design, SOLID, to name a few of the better known programming practices and had always believed that I was on a true path to robust, maintainable software. Now I find myself in a position where over the space of just one year I have already questioned many of the practices I had learned and taught in the preceding decade. I hope to share on this blog much of what I have discovered of late but for my first entry discussing programming practices I want to talk about abstractions. In particular I want to call into question what I have come to understand as overuse of abstractions – hiding implementations away in layers/packages, behind interfaces, using IoC and dependency inversion – as often encountered in the C#/.NET and Java world. I have been wondering lately if I have simply spent years misunderstanding and misapplying abstractions, but I have seen enough code written by others in books, tutorials, blogs, sample code and more diagrams than I can bear to know that I have not been alone in my practices. Furthermore, I have found myself on a few occasions of late in discussions with developers of similar experience who have come to share a similar feeling towards abstractions. So what do I mean by abstractions and what is the point of them, really? The old premise and the one that I would always reiterate is that abstractions help enforce separation of concerns (SoC) by isolating implementation details from calling code. The reasoning being that code of one concern should be able to change without affecting the code dealing with other concerns, supposedly because code dealing with one concern will change for different reasons and at different times than the code dealing with other concerns. Of course we mustn’t forget that one of the more natural causes of abstractions is the isolation of logic to enable Unit Testing. Ultimately the result is that software is written in such a way that the different code dealing with different concerns is kept separate by abstractions such as interfaces and layers while making use of IoC and Dependency Injection to wire the abstractions together. Furthermore it is worth me stating that the usual separate ‘concerns’ touted by such advocacy frequently includes Presentation/UI, Service/Application Logic, Business Logic, Data Access Logic, Security, Logging, etc. Abstracted code, obscurity through indirection. I am not about to start claiming that everything should just be thrown together in one Big Ball of Mud. I still feel that SoC certainly is worth following but it can be effectively achieved by applying simple encapsulation, such as putting more repetitive and complex logic of one concern within its own class so that it may be repeatedly invoked by code dealing with other concerns. An example of this would be the code to take an entity key, fetch and materialize the correlating entity from a data store and return it to the caller. This would be well served in a method of a repository class that can be called by code that simply needs the entity. Of course packages/libraries also have their place, in sharing logic across multiple applications or solutions. Where I see problems starting to arise is when, for example, the aforementioned repository is hidden behind an interface, likely in a separate layer/package/library and dynamically loaded by an IoC infrastructure at runtime. Let’s not pull any punches here, this practice is hiding significant swathes of software behind a dynamic infrastructure which is only resolved at runtime. With the exception of some very specific cases, I see this practice as overused, unnecessarily complex and lacking in the obvious transparency that code must feature to be truly maintainable. The problem is further compounded by the common definition of the separate concerns and layers themselves. Experience has shown me that when coming to maintain an application that makes use of all of these practices you end up with a voice screaming in your head “Get the hell out of my way!”. The abstractions don’t seem to help like they promise and all of their complexity just creates so much overhead that slows down debugging and impedes changes of any significant proportion. With one exception I have never spoken to anyone who has ever had to swap out an entire layer (i.e. 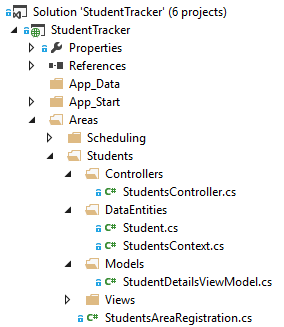 UI, Services, Logic, Data Access, etc.) of their software. I’ve personally been involved in one project where it was required but it was a likely eventuality right from the start and so we were prepared for it. I have rarely seen an example of an implementation of an abstraction being swapped or otherwise significantly altered that did not affect its dependents, regardless of the abstraction. Whenever I have seen large changes made to software it very rarely involves ripping out an entire horizontal layer, tier or storage mechanism. Rather it will frequently involve ripping out or refactoring right across all layers affecting in one change the storage tables, the objects and logic that rely on those tables and the UI or API that relies on those objects and logic. More often than not large changes are made to a single business feature across the entire vertical stack, not a single conceptual technical layer and so it stands to reason that should anything need separating to minimise the impact of changes it should be the features not the technical concerns. So my main lesson here is that: The reality of enforcing abstractions through layering and IoC is very different from the theory and usually is not worth it, certainly when used to separate the typical software layers. With the exception of cases such as a component/plug-in design I am now completely convinced that the likelihood of layered abstractions and IoC ever paying off is so small it just isn’t worth the effect that these abstractions have on the immediate maintainability of code. It makes sense in my experience not to focus on abstracting code into horizontal layers and wiring it all up with IoC but to put that focus into building features in vertical slices, with each slice organised into namespaces/folders within the same project (think MVC areas and to a lesser extent the DDD Bounded Context). Spend the effort saved by this simplification keeping the code within the slices clear, cohesive and transparent so that it is easy for someone else to come along, understand and debug. I’d even go so far as to try to keep these slices loosely dependent on each other – but not to the point that you make the code less readable, i.e. don’t just switch hard abstractions of layers into hard abstractions of slices. I don’t want to offend anyone, I’m just putting my experience out there… why not give this a try… I promise you probably won’t die. Take a look at the following updated controller action. You know almost exactly what it is doing just by looking at it this one method. This contains ALL of the logic that is executed by the action and to anyone first approaching this code they can be confident in their understanding of the logic without having to dig through class libraries and IoC configuration. Any changes that are made to the action would simply be made here and in the DB project, so much more maintainable! Being completely honest, even recently, seeing code written like this would rub me up the wrong way so I understand if this gets some others on edge but I’ve come full circle now and am pretty convinced of the simplified approach. And its this dichotomy I’d like to discuss. Transparent, maintainable, intention-revealing code and no need for IoC! So this has been my first attempt to open up some conversation around the use of abstractions in software. I’ve tried to keep it brief and in doing so I’ve only just scratched the surface of what I have learned and what I have to share. There is still so much more for me to cover regarding what I and others I know in the community have been experiencing in recent years: Should we abstract anything at all? What is maintainable if not SoC via IoC? How do we handle external systems integration? What about handling different clients sharing logic and data (UI, API, etc.)? How does this impact self/unit-testing code? When should we go the whole hog and abstract into physical tiers? I could go on… So I intend to write further on this subject in the coming weeks and in the meantime it would be great to hear if anyone has any thoughts on this, good or bad! So drop me a line and keep checking back for further posts. How do you unit test then? Sorry for late reply. If you keep your features organised into feature folders and take care not to create interdependencies then coarse grained integration testing is very easy and I find it to be less intrusive and more effective. Also Microsoft Fakes Shims are incredible if you have some particularly complex logic that warrants its own isolated tests.